The blogosphere has been abuzz with talk of the Millennial generation for a while now - and we’ve talked about designing eLearning for them ourselves. But the times are changing, and now it’s time to start thinking about the next gen.
Born after the mid-90s and raised in the 2000s, this new ‘Generation Z’ workforce is set to account for 20 percent of working adults by the year 2020. With this in mind, we would be looking at a unique situation of four distinct generations working alongside one another, including Baby Boomers, and the infamous generations X and Y. What are the changing work attitudes that Generation Z is introducing into the mix? Well, flexible attitudes to working hours, increased use of technology (especially mobile), amongst others. According to some figures, up to 90% of Generation Z workers prefer a dynamic and fast working environment, while up to 70% expect that their working hours will exceed the traditional 40-hour working week . All this means that Gen Zer's bring a different set of expectations and behaviors to the table, which is why 7 out of 10 leaders are concerned about how they will fit in at the workplace. As an industry, it’s time that we start thinking about tomorrow’s workforce today. Companies need to plan to educate, train, and recruit these young workers. So now let's get to know them better. Also known as the iGeneration, these are individuals born after the year of ’95. That said, they are recent college graduates. 61 million Gen Zers are about to enter the US workforce and radically change it forever. The next few decades will see more and more of them entering the workforce. While Gen Z is the kids of Gen X, they’ve grown up in an unimaginably different world. Gen Z has “grown up in the digital age and have never known a pre-Internet world”. How do they compare to Millennials? Gen Z is remarkably different from Millennials. Due to their “snack media” habits, this generation consumes information by switching between multiple platforms and devices (They multi-task across 5 screens on average). This snip-snap from platform to platform is a defining feature of Gen Z, and since a picture paints a thousand words, it seems like imagery is more their style: think Instagram and Snapchat as their primary modes of communication. Not to mention the fact that they’re natural information-seekers. They’ve grown up alongside YouTube, Wikipedia, and eHow. They know how to locate the information that they’re looking for and aren’t afraid to be resourceful. This might materially affect how we design our eLearning, because if it’s not clear, short, succinct and available across multiple platforms, the learner may just go somewhere else. Think of Buzzfeed. This news site is widely used by young people because articles are short and visual. Even though Millennials are tech-literate and able to embrace the winds of change, there’s no denying that while they grew up with dial-up Internet, Myspace and AOL, that’s a hugely different experience to Facebook and Google. Gen Z has grown up, and their entire lives are even being documented as we speak on social media, either by themselves or by their parents. The world is smaller, technology is faster, and the world exists largely on a screen. This may sound undesirable, but, as a result, Gen Z has stronger virtual communication skills, online collaboration skills, and more of an entrepreneurial spirit: they’re used to finding and working things out for themselves. They grew up in a framework of already established social media and learnt to find info online from an early age. One drawback, though, may be the short attention spans that go with this – You’re going to have just about 8 seconds to engage with them. 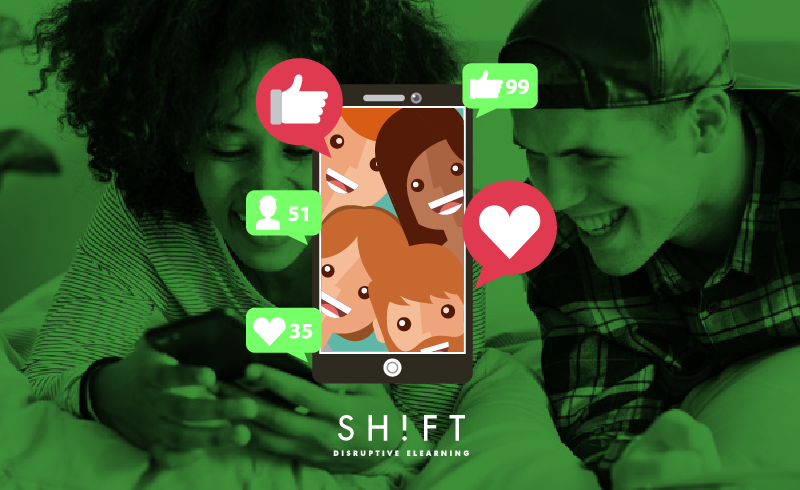 So, how do we connect with Gen Z learners? Use mixed media and visually-stimulating messages. Remember Generation Z is a 'visually-orientated generation', therefore, the more image-based your courses are, the better. "Short YouTube-like instructional videos are especially effective" said Denise Villa, founder of The Center for Generational Kinetics. Provide flexibility: You will have to make training more flexible for Generation Z and their ‘as-and-when’ approach to learning. Gen Z learners enjoy a higher degree of self –study and autonomy. Giving them choice and freedom in their subjects of study, when appropriate, is the key to helping develop motivation and self-confidence. Encourage collaboration and human connections. While Gen Z learners may need less training on technology, they may require more in offline interpersonal communication. They are also used to freely expressing their opinions online, so make sure you encourage collaboration between them through forums, group discussions and Question & Answer sessions. Feed their "snack media" habits. You need to create bite-sized learning modules, to keep Gen Z-ers attention. Easy-to-use. Gen Z-ers expect workplace technology to be intuitive, accessible, easy-to-use. For them, out-of-date or difficult to use software equals being left behind and may make them feel frustrated. Go mobile or go home. According to Brian Solis in his 25 Disruptive Technology Trends 2015–2016, “Generation Z is mobile first and mobile only”, therefore it becomes critical that your training is available on mobile devices. That’s about it for now. These key points are ready to take away and implement into your future training plans for Gen Z. As they join the workforce, Gen Z is going to be a bigger and bigger consideration. We’ll be here, keeping you updated, as the future of learning unfolds with a new generation of professionals.